After President Park Geun-hye said that criticism toward her has gone too far, the Prosecution Service announced plans for an ongoing internet monitoring program after September 16th. This was set up to investigate the spreading of false information, or extreme cases of defamation against individuals. However, after the announcement, the Prosecution Service gave notice of their intention to seize the KakaoTalk account of Jung Jin-woo, Vice President of the Labor Party. The Prosecution Service also requested records of his personal information from Daumkakao, the biggest instant messenger company in South Korea. This controversy has led to widespread belief that this plan was actually intended for government surveillance of personal communication. On October 1st, Jung Jin-woo was informed that his KakaoTalk messages, telephone numbers, photo files, and information of his 3,000 acquaintances were confiscated by the Prosecution Service. He was under prosecutor’s investigation for breaking the law on assembly and demonstration. As most of his 3,000 messenger friends were not directly connected to violating the law, the dispute over keeping privacy is getting bigger and bigger. Surveillance means to inspect one’s act or comment secretly. From 1960s to late 1980s, when South Korea was under dictatorship, there was a lot of surveillance of democracy movement activists. Usually it was conducted by staking out or following individuals. 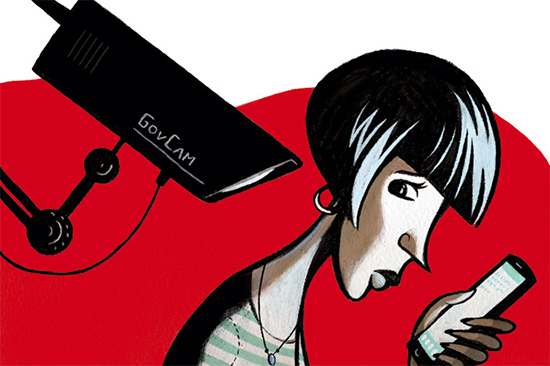 As technology has developed, the methods of surveillance have also varied. Nowadays, it is usually conducted through hacking computers or smart phones, which has become much easier than ever before. With the changing times, the number of cases of surveillance by government agencies like the Prosecution Service or the National Police Agency has increased. From the first half of 2013 to the first half of 2014, the requests for monitoring warrants or confiscation warrants have grown, as well as the actual number of warrants issued. The total number of monitoring warrants issued has increased from 35 to 57, and confiscation warrant from 815 to 1,640 over the time. As the number of warrants issued increased, some problems emerged. First, the number of warrants issued is far too high. The number has doubled in a year. This means that government agencies may be abusing privacy laws in their investigations, and disregarding individuals’ personal privacy rights. Issuing warrants too frequently makes one’s privacy valueless. However, above all things, the fundamental issue is whether the government has the right to invade personal privacy by conducting cyber surveillance or not. Of course, when a country is in dangerous situations like wartime conditions, the government should act against threats. Otherwise, abuse of governmental authority may infringe on one’s freedom of speech. People who are angry with Daumkakao and the government’s irrational behavior have reacted to this controversy by setting up accounts with foreign mobile messengers, whose servers do not exist in South Korea. Netizens began using the term ‘cyber refuge’ to refer to these situations. In Korea, preference for foreign mobile messengers has been more than just a trend recently. Several security plans to secure personal information that KakaoTalk does not have are leading people to make an account at foreign mobile messengers. What are current statistics on the number of people in South Korea seeking cyber refuge? In the last week of September, after the controversy about cyber surveillance erupted, the number of Kakao Talk users decreased by about 410,000. Also the stock price of Daumkakao, which serves KakaoTalk, fell by 15.7 percent. This phenomenon is the result of the weak security system of KakaoTalk compared to other foreign mobile messengers. In case of KakaoTalk, the messages exchanged between people are stored in the server for a week. Daumkakao reduced the storage period into three days after the dispute over cyber surveillance. Other internet-based messengers have different security systems. In case of Twitter, whose server is based on the U.S., it took legal action against the U.S. government which requested excessive user information too often. This made more Americans trust in Twitter as a Social Network Service (SNS). Among the numerous instant messenger services all over the world, Telegram is getting much attention because of its special security system. Telegram is a mobile messenger whose server is based on Germany. The two developers, Nikolai Durov and Pavel Durov, are actually Russians. In Russia, they developed ‘Vkontakte,’ which is similar to Facebook. However, after realizing that the Russian government has been monitoring Vkontakte, they left Russia and settled in Germany. Telegram uses a coding system when storing messages in the server. The coding system is so strong that nobody has deciphered the encoded messages up until now. Also, in secret chat rooms, individuals can set an automatically-deleting timer if they want, so that the messages would not be stored even in an encoded form. As Telegram adopts totally different security system compared to KakaoTalk, the number of members is skyrocketing. In the third week of October, the number of Korean members increased by 2.6 million, and downloads are still breaking records. According to Google Play, the download ranking of the application has risen from outside of the top 100 to 13th overall. The press freedom group ‘Reporters without Borders’ recently released a supportive statistics, comparing between Telegram download rankings and Press Freedom Indexes for several countries. Reporters independently monitor press freedom in countries around the world, and release an annual report of rankings. According to a report in JTBC, the popularity of Telegram shows a clear trend in relation to press freedom. For example, in 2014, the download ranking of Telegram in Uzbekistan, Brunei, and Malaysia is 4th, 16th, and 17th while the Press Freedom Index is 166th, 117th, and 147th respectively. Yamin Yussof, a junior exchange student from Brunei, majoring in Mathematics, said, “I have heard of Telegram and I have used it. In my country, the government is monitoring messenger applications and would take actions if there are any inappropriate activities.” About the issue that happened recently in Korea, Yamin added, “I am 50-50 on this as it depends on what the government is censoring. In addition, I do not mind too much if the government decides to apply censorship as long as I still have a mean of communication.” On the other hand, the download ranking of Telegram in Finland, Netherlands, and Norway is 359th, 285th and 637th, while the Press Freedom Index of those three countries is top three among the surveyed countries. A country has a responsibility to protect its citizens from danger. However, excessive demands for personal information by the government can be even more dangerous. In addition, seizing mobile messengers without an individual’s prior consent is a misuse of government’s authority.